Well, It seems that I have been out done again with all of these blogs that are being done almost daily. Well, I can't say that I can commit myself to that rigorous schedule but I guess I should try to stay more up to date. Let's see I guess I will just start with today....First of all I was looking forward to sleeping in this morning since it is Saturday and all, but to my dismay I was awakened at 6am by the sound of screaming that the tv had a blue screen and he couldn't see the cartoons..yes, it was Carter, for those of you who know me you will know that this is a normal routine at our house only we normally make sure that the tv is NOT on the BLUE screen!! So I very grouchily got my pillow and blanket and went to the couch and fixed the tv and I just figured I would stay there so I would be closer for the next request. Then about 30 min. later ofcourse he is hungry, but I threatened him with an inch of his life that if he asked me for anything else before 7:30 he would be starving all day long..I know I am mean but I was tired.. So about 7:30 Dawson woke up and I had to make some jelly toast...I was already up since 6am so I decided I would go ahead and take a bath and get ready for the day. We left the house about 8:30 and hit a community garage sale about a mile down the rode. That was fun and then at 10:00 Dawson had soccer..finally a warm day of soccer..After that we went to Target to get the last things for Blake's Birthday Party tomorrow. Then we went to the Life Way Christian Store where I picked out a new Bible for Blake for his present from us. Carter and Dawson loved it there because they have a kids section where they can sit and watch Veggie Tales while parents are shopping. That is the best thing anyone could have thought of in my opinion. It was a quick and painless trip. We have one more stop later at Walmart to get some decorating tube of icing so I can decorate Blake's cake like a rocket ship. At 5:30 we have a birthday party to go to and then I guess that will end our day. Oh, and I really need to clean out my car to make room for the party stuff. Tomorrow is Blake's Party...I will post pictures with that. It started snowing yesterday at about 10:00. It snowed for a long time. Several hours. The boys were so excited to see snow. 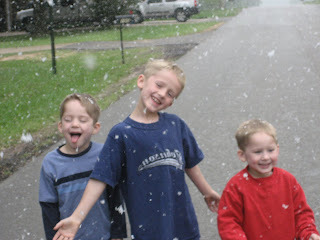 Blake and Carter have played in the snow once before but were probably to young to remember. 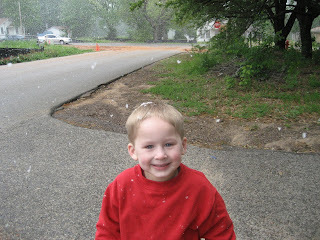 Dawson has never seen snow and he was so excited. 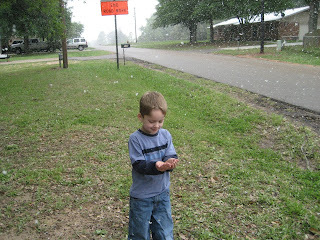 At one point it was really coming down and they said that is looked like a snow globe outside! It has been a while since my last posted but I will try to do better. Dawson is playing soccer and t-ball. Carter is playing t-ball and Blake is playing baseball. I will posted some pictures of them when we get their uniforms.